Mask Maker Sergio Boldrin leads parade in Piazza San Marco for "Beheading of the Bull" during Venice Carnival 2019 Photo: Cat Bauer (Venice, Italy) After discovering that my article "Venice Carnival 2017 and a Brief History of Mask-Making" that I had first published on this blog in 2008 had been plagiarized, we have finally dug up the original print newspaper article. 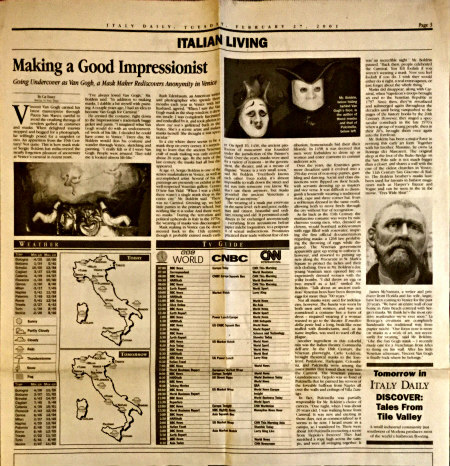 I had written a feature entitled "Making a Good Impressionist - Going Undercover as Van Gogh, a Mask Maker Rediscovers Anonymity in Venice" for the International Herald Tribune's Italian supplement, Italy Daily, way back on Tuesday, February 27, 2001, and am the copyright holder. I had published an edited version of that article on this blog in 2008 and again in 2017, and had re-titled it. Here is the original article in its entirety, with photos from the 2019 Venice Carnival. Enjoy. 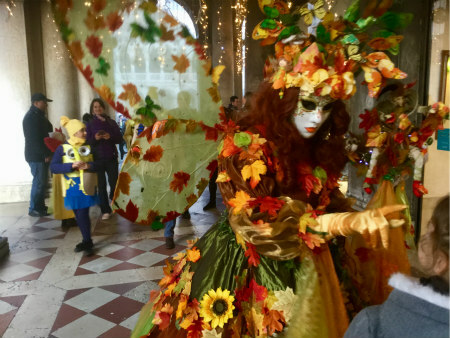 Vincent Van Gogh carried his latest masterpiece through Piazza San Marco, careful to avoid the crushing throngs of revelers garbed in costumes and masks. When delighted tourists stopped and begged for a photograph, he willingly posed for a snapshot or two. An apparition from the 19th Century? 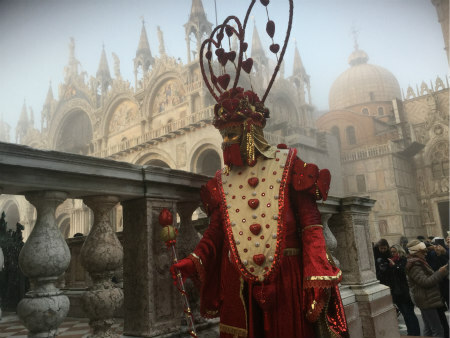 Not quite This is how mask maker Sergio Boldrin has rediscovered the nearly forgotten pleasure of anonymity at Venice's carnival in recent years. "I've always loved Van Gogh," Mr. Boldrin said. "In addition to making masks, I dabble a bit myself with painting. A couple years ago, I had an idea to beceom Van Gogh for Carnival." He created the costume right down to the Impressionist's trademark baggy jacket and pants. "I imagined what Van Gogh would do with an undocumented week of his life. I decided he could have come to Venice" Every day, Mr. Boldrin would don his costume and wander through Venice, sketching and painting. "I really felt as if I were Van Gogh. People were amazed. They told me it looked almost life-like." Ruth Edenbaum, an American writer and photographer who spends three months each year in Venice with her husband, agreed. "When I saw the Van Gogh mask in the shop window, it drew me inside. I was completely fascinated and enthralled by it, and took photos to show our son's girfriend back in the States. She's a scenic artist and makes masks herself. She thought it was spectacular." 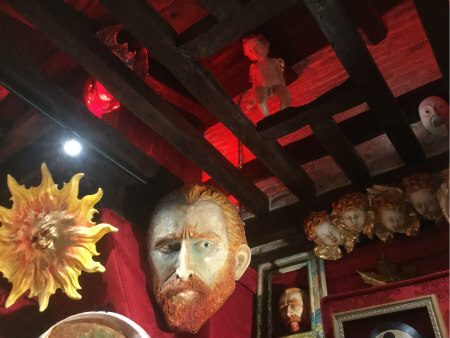 Oversize Van Gogh mask in Bottega dei Mascareri 2019 - Photo: Cat Bauer In a city where there seems to be a mask shop on every corner, it's surprising to learn that the ancient Venetian craft of mask making was only revived about 20 years ago. By the turn of the last century, the masks had all but disappeared. At age 43, Sergio Boldrin is one of the senior mask makers in Venice, as well as an accomplished artist. Several of his oil paintings are presently on exhibit at the well-respected Venetian gallery, Centro D'Arte San Vidal. "When I was a child, there wasn't a single mask shop in the entire city," Mr. Boldrin said. "There was no Carnival. Growing up, we had little parties in the primary school, but nothing like it is today. And there were no masks." During the terrorism and political upheavals in Italy in the 1970s, the wearing of masks was discouraged. Mask making in Venice can be documented back to the 13th century, though it probably existed much earlier. On April 10, 1436, the ancient profession of mascareri was founded under the jurisdiction of the Painter's Guild. Over the years, masks were used for a variety of reasons -- in the government, the theater, and as a means of disguise. "Venice is a very small town," said Mr. Boldrin. "Everybody knows each other. Even today, it's almost impossible to walk down the street and not run into someone you know. We don't use them anymore, but masks provided the ancient Venetians a degree of anonymity." 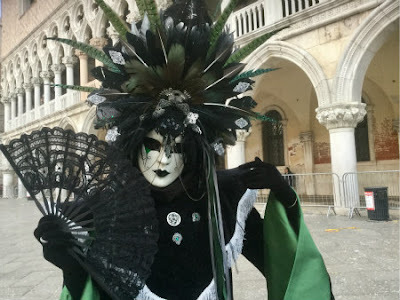 Venice Carnival 2019 - Photo: Cat Bauer The wearing of a mask put everyone on the same level: rich and poor, nobleman and citizen, beautiful and ordinary, young and old. It permitted confidences to be exchanged anonymously -- everything from accusations before papier-mâché Inquisitors, to a potpourri of sexual indiscretions. Prostitutes practiced their trade without fear of retribution; homosexuals hid their illicit lifestyle. In 1458, it was decreed that men were forbidden to dress up as women and enter convents to commit indecent acts. Over the years, the festivities grew more decadent until it evolved into a 250-day event of non-stop parties, gambling and dancing. Social and class distinctions were flipped on their heads, with servants dressing up as masters and vice versa. It was difficult to distinguish a housewife wearing a traditional mask, cape and three corner hat from a nobleman dressed in the same outfit, allowing both to move freely through the city without fear of recognition. Venice Carnival 2019 - Photo: Cat Bauer As far back as the 11th Century, the mattaccino costume was worn by mischievous young men, who, dressed as clowns, would bombard noblewomen with eggs filled with rosewater, inspiring the first official documentation regarding masks: a 1268 law prohibiting the throwing of eggs while disguised. The Venetian government apparently gave up trying to enforce it, however, and resorted to putting up nets along the Procuratie in St. Mark's Square to protect the ladies and their rich clothing. Even in Mr. Boldrin's day, young Venetian men opened fire on expensively dressed women with the yolky bombs. "I did throw an egg or two myself as a kid," smiled Mr. Boldrin. "Talk about an ancient tradition! Venetian boys have been throwing eggs for more than 700 years." Not all masks were used for indelicacies, however. The bauta was worn by both men and women, and was not considered a costume but a form of dress -- required wearing if a woman wanted to go to the theater. Il medico della peste had a long, beak-like nose stuffed with disinfectants, and, as its name implies, was used to ward off the plague. Venice Carnival 2019 - Photo: Cat Bauer Another ingredient in this colorful mix was the Italian theater, Commedia dell'arte. In the 18th Century, the Venetian playwright, Carlo Goldoni, brought theatrical masks to the forefront. Pantalone, Harlequin, Colombina, and Pulcinella were among the many masks that found their way into the Carnival. The Venetian painter, Giandomenico Tiepolo was so fond of Pulcinella that he painted his version of the lovable buffoon from Naples all over the walls and ceilings of Villa Zianigo. In fact, Pulcinella was partially responsible for Mr. Boldrin's choice of careers. "One night, when I was about 20 years old, I was walking home from Carnival. It was new and exciting in those days, not as commercialized as it seems to be now. I heard music in a campo, so I wandered by. There were about 100 Pulcinella reenacting a scene from Tiepolo's frescoes! They had stretched a rope high across the campo, and were all swinging together. It was an incredible sight." Mr. Boldrin paused. "Back then, people celebrated the Carnival. You felt foolish if you weren't wearing a mask. Now you feel foolish if you do. I wish they would either do it right, a real extravaganza, or just forget about the whole thing." 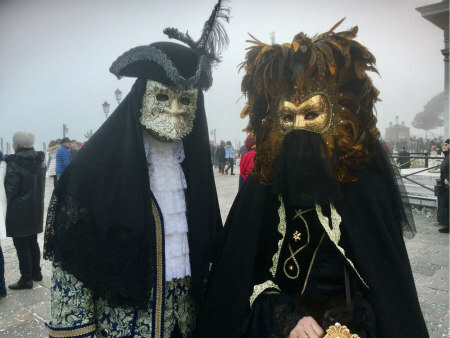 Venice Carnival 2019 - Photo: Cat Bauer Masks did disappear, along with Carnival, when Napoleon's troops brought an end to the Venetian Republic in 1797. Since then, they've resurfaced and submerged again throughout the decades until being vanquished to the pages of history books by the 20th Century. However, they staged a spectacular comeback in the late 1970s when a group of young people, then in their 20s, brought them once again into the forefront. Mr. Boldrin has been a major force in reviving this early art form. Together with his brother, Massimo, he owns La Bottega dei Mascareri. The original shop at the foot of the Rialto Bridge on the San Polo side is not much bigger than a closet, and shares a wall with one of the oldest churches in Venice, the 11th Century San Giacomo di Rialto. The Boldrin brother's masks have been used for layouts in fashion magazines such as Harper's Bazaar and Vogue, and can be seen in the movie, "Eyes Wide Shut." James McNamara, a writer and producer from Florida and his wife, Angie, have been coming to Venice for the past 20 years. "We have an entire wall of our home in Palm Beach covered with Sergio's masks. We think he's the most creative mask maker we've ever seen." La Bottega's creations are completely handmade the traditional way, from papier-mâché. "Our focus now is more on masks as a work of art, not necessarily for wearing," said Mr. Boldrin. "Like the Van Gogh masik -- I recently made one for a Frenchman from Arles to hang on his wall. After his little Venetian adventure, Vincent Van Gogh is finally back where he belongs." Original Italy Daily article by Cat Bauer on Feb. 27, 2001 That is a scan of the original newspaper article. As you have read, I put an enormous amount of work and research into the piece, and do not appreciate unethical individuals plagiarizing even a section of it as if they wrote it themselves. However, I would be delighted if those with genuine interest would like to quote a portion of this article. Please give correct credit to Cat Bauer as the author, and link back to this post. Thank you.